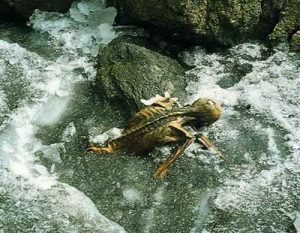 Several years ago, when I first published information from the Billy Meier case pertaining to his advance knowledge of the discovery of, and specific details about, the so-called Iceman Mummy, skeptics were of course quick to try to debunk it. They apparently didn’t learn anything from the royal drubbing their fellow skeptics gave themselves, when they tried to debunk Meier’s Jupiter information…and ended up corroborating it instead. In the Iceman matter, when claiming that Meier had backdated his information about Urk, as the Plejaren called him and as I’ll refer to him, they relied on the initial speculation from scientists that he had been murdered by being shot with an arrow, contrary to what the Plejaren said about Urk having fallen on an arrow and hitting his head on a rock, as a result of an epileptic seizure. The possible connection between gastritis and epilepsy is also mentioned here. New scientific information also revealed that Urk had a full stomach, with a large amount of undigested meat in it. That “the Iceman wasn’t overly concerned with cleaning the meat before he ate it” and that “It wasn’t the most hygienic of meals,” could have increased the risk of his gastritis and/or ulcers contributing to the epileptic seizure that the Plejaren said caused him to fall to his death. A theory that he was fleeing for his life from killers wouldn’t be consistent with his having had the relative luxury of taking the time to prepare and eat the large meal itself…which may be better explained by what Ptaah told Meier, i.e. that Urk was “a member of a group of 14 persons who had camped there in the mountains”. 588. His death happened at that time in such a way that he fell (Note by CF: not just from standing to the ground, but some distance down) – caused by an epileptic fit – and was severely injured by one of his own arrows when he fell on his back, just at the moment when a primeval ice storm started. 589. As a member of a group of 14 persons who had camped there in the mountains, he was left laying on the ground because of his critical injury. Since the remaining 13 human beings were fully occupied with saving their own lives, they did not care for him. 590. Nevertheless, not all of them survived, as several of them died in the ice needle storm. The arrows that were found in his quiver were protected from the elements, unlike the missing one that may have broken off upon impact with the rocks, and/or was pulled out of him by a companion and discarded. 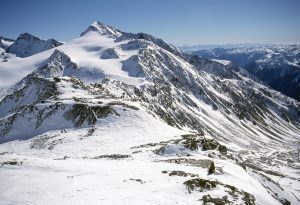 As described here, “as they traversed an elevated plateau near a retreating mountain glacier at some 3210 meters above sea level, they passed a gully”. So the presence of the higher place from which he would have fallen to the lower level is indeed established. The photographs also make clear that there’s a huge rock, perhaps many, upon which he could have landed on his back and then rolled onto his outstretched left arm, either deliberately as suggested above, or by the momentum from the fall, or he could possibly even have been turned on his stomach by one of his companions to determine his condition. The research – including the newest discoveries over more than 20 years subsequent to Meier’s preemptively published information – indicates that this man had a large, undigested meal and suffered from both gastritis and ulcers, which are medically associated with, and can trigger, the epilepsy that could have caused him to fall from the plateau onto the rocks below in the gully. He had weapons that didn’t belong to him, including arrows made by two different people (we don’t know if one of the arrows was made by him). The blood* that was discovered on him and his belongings may be explained by, as Ptaah said, what occurred while he and his compatriots were attending to the dead and dying and from whom the weapons were taken. The presence of the intact weapons, etc., would be supported by the sudden onslaught of the ice storm that initially buried him. That he wasn’t murdered but did indeed take that fall is also supported by a new scientific assessment. Contrary to skeptical expectations that new discoveries from scientists over the years would increase the evidence that Meier backdated his information, instead the new information actually supports his original narrative…even better than when he first published it. This information will certainly prove Urksome to the desperate skeptics who tried to make a claim to fame by attacking Meier’s information and his character. The goat that Urk ate has now gotten the skeptics and their equally indigestible theories. And since we already have the skeptics by the short hairs, perhaps the scientists will also now examine to see if there’s evidence that Urk himself didn’t have…pubic hair, which is what the Plejaren also claimed. “5. Truth is that Urk, together with his 13 comrades and in the Öetztal Mountains, was observing a fight to the death between six human beings of two rivalling groups or tribes, respective, who were killing one another. 6. When they were dead or dying, Urk and his companions came forth from their hiding-place and were unsuccessfully caring for the dying, and during this process Urk and also his companions were besmirched with the blood of the critically injured. NOTE: The word “fits” is also a colloquial (informal) term for epileptic seizures. Michael, at least 9 dead in Munich, shot by Islamic terrorist, it won’t stop. ISIS must be stopped! Start sending emails to the WH asking for a worldwide coalition of peacekeeping troops. One of the mandates of the peacekeeping troop would be to fight racism but not in a punch you in the face sort of way, of course. I find it very interesting that the same man who filmed this Germany incident also filmed the Nice incident, Richard Gutjahr. What are the chances that he would be in both places? Everyone, please post comments in appropriate in blogs. Trump and Clinton sent their “prayers” to Munich. What a joke, who do they pray to? Santa Claus, the Easter Bunny, or the tooth fairy? Idiots. Usually “prayer” is reserved for your own spiritform. Although I did ASK the Easter bunny for a Cadbury cream egg once and he came through. The Wikipedia page for Billy used to be neutral before Mahesh biased it towards emphasising the case as a hoax and the dark illogic he aspouses, whereby it cannot be valid unless it’s 100% perfect and accurate can and never will move the case on. In the future, Mahesh’s efforts will be seen for what they are: unrealistic expectations of a spoiled brat whose ego has gotten out of control. One massive flaw in arguments for and against the Meier case is thinking that the contact reports are there to “prove” the case. The contact reports will never do that due to the laws that the Plejaren Federations follow around what ETs can do when contacting less evolved human beings on other planets, i.e., they cannot reveal anything in the contacts pertaining to scientific information that has not already been gleaned through earth humans’ own efforts. They certainly have no need to prove to us that they exist, or, they would have done that unequivocally. They only give encouraging nudges, using controversy a as tantalising carrot. towards an understanding of their warnings for us to take them seriously and do something with those warnings. 1. That Meier is being contacted by powerful and technologically advanced ETs. 2. That Meier is being contacted by powerful and technologically advanced earth human beings. I’ve considered both possibilities when thinking about the case and peopke have to come to their conclusions. The argument that Meier is a simple liar and hoaxer is stupid when you consider the fact that CRs are hardly ever shown to be wrong later and the information they pertain to is corroborated. Those too afraid to try the two possibilities, do not even attempt to answer how Billy could have had access to ALL those obscure papers, essays, books and Mahesh repeatedly IGNORES that question, but, just SUPPOSES he could, without any evidence to support that. How is that a serious investigation or scientific? Michael delves right in and invites us to do that also in his MMO argument, which is repeatedly ignored by Mahesh. Many people get frustrated that the Plejaren will not produce contact reports that will be earth-shattering, but, what have the Plejaren got to prove in the contact reports other than document conversations between them and a very intelligent Earth human being. Is their mission to prove to us that they are who they say they are? Why would they need to prove that to anyone? Skeptics look at the contact reports and pick them apart as if everything that is discussed should be 100% perfect and accurate, as if that the “proves” anything, but, the Plejaren have never claimed an ability to do that, so why is this so important to people? In fact, the Plejaren discuss errors and oversights openly. The idea that the Pleajren must be perfect is reflected in the two sides of the argument about the information in the case; where stupid know-it-all skeptics think everythjing must be perfect, or, it is rejected outright and thhose who support the case, but, explain the errors as purposeful for some deeper reason, e.g., James Deardorff whicjs os equally stupid. Rarely is the view that the case must be perfect and 100% accurate to be valid questioned in very down to earth terms. This belongs, in my view, to the religious genetic brain malfunction, which I am not immune to myself, but am able to identify that in myself when it arises. So, no, Mahesh does not and will not advance anything in anyone’s thinking as you stupidly suggest. So why are supporting that crap when all life is at stake? I don’t know if Mahesh has yet tried to refute the new information and my conclusions pertaining to the Iceman. In order to do so, he would have to concoct something so bizarre – and so completely devoid of plausibility interns of MMO – that he’d probably have a mental breakdown attempting it. He and the other skeptics don’t ever deal with MMO because they…CAN’T. Not a one of them knows how to think in this manner with actual logic, focusing on the facts and drawing reasonable conclusions. And MMO is inescapably necessary when trying to investigate, piece together, deduce etc., using the factual evidence. Yes Michael. I’d like to see him try, but, in my experience he doesn’t touch anything that he may not be able to answer fully so as to maintain the deluded image he has of himself as an intellect. I realise I got a bit heated in my comment above, but, observing this blog, I’ve noticed that Matt/Newinitiation appears to enjoy making trouble whilst hiding behind a very thin veil of neutrality and it’s about someone called him out for it. Wasn’t it matt/newinitiation that first suggested that John was Asto-Tony? He’s said that a few times now about others interacting here. A few other comments have alerted me to matt and the one he made on the forum… I honestly tried to be neutral about, but, good sense got the better of me and I think he needs to explain just what he was thinking by suggesting Mahesh’s contributions are positive. Also, in regards to the “mistakes” mentioned above, e.g., by Deardorff, I think the Chinese call them God leaks or some such, which is of course nonsense, but the ideas that they can reveal important things interests and Billy made a few whilst I was with him that I’d like to discuss with you privately when the time is right as they too appeared to me to be leaks of a knowledge that may even pertain to you, but, I cannot say that with 100% confidence – just my thinking about them afterwards, which may be in error, of course. Matt Knight see my response to you on FIGU forum when the moderators put it up. Listen, I addressed you here and you obviously read it and I do not give you permission to share my post on the forum. I have not asked you anything on the forum as Scott closed the thread (which I why I posted here as I kinow you come here – and I was right). Like I said – trouble maker. Oh and if you posted the info from Billy about skeptics, please note this was about skpetics – not about people calling him a fraduster, hoaxer and liar which Mahesh is now doing so any such referecne does not apply. I don’t even see your post on the forum so it must have been rejected, so, if you wanna chat here then do. Well seeing as it was a bloody long post and the fact that it was about Mahesh it may have been censored. Now I put up a post in response to you at FIGU forum in keeping with the spirit of consistency as well as maintaining the context which led up to it but also the conversation started there so why didn’t you respond there, it makes for easier reading anyway plus the post doesn’t get lost easily. No – The “conversation” started here, as this is where I addressed you directly. We all know “the context” so who are you fooling? I’ve already explained the reasons why I posted here, so, no need to repeat myself. Matt then what is your point. The topic on Mahesh started at FIGU forum the point at which time he posted about the distance between Vesuvius and Rome which you dragged along here and of all threads it had to be Ortzi which I nearly missed BTW. I have covered your questions so what else do you want me to cover? If you bothered to read my post here which I don’t think you have you haven’t addressed any of it. Now is there something else afoot or are you trying to side skirt the issue. If you’ve called me out for something suspect then by all means address my responses I have provided on your posts without coming off as someone who is now trying to evade it with such lame response as ‘who are you trying to fool’ when those very posts of mine are all out in the open for people to read and reread. Its foolproof if you get what I mean. Now I am of the position that if I am willing to give then I sure better be willing to take as well. So I welcome your challenge. Why not also trove through the content of some of what this supposed John Jacobson wrote on this blog as your first point of priority rather than worrying about whether I have called someone by a different name. You will find that this character has penchant for not addressing most of fellow bloggers contention to his often racist remarks and victim playing but evade them like a slippery eel in the style of Astro Tony with insults and character assassinations. So where does your priority lay Matt. Funny how JJ has gone AWOL all of a sudden. Now how about showing me the same courtesy as you have John Jacobson by reading my old posts regarding Mahesh on this forum and coming to the defense of the truth and since there are bigger fishes to fry why not bark up the right Mahesh tree about his antics which for those in the loop deem it very unsavoury rather than create turmoil inside your head from misunderstanding a few sentences of mine that now I am calling you out on. My point is that I addressed you here, but, you took it to the forum to get the support of people baised towards supporting Mahesh’s delusion for their own reasons. So JJ has gone AWOL. Well done. That’s another person put off because we are all suddenly sensitive about “racists”. What a terrible thing for us all to have to deal with. Poor us (ignoring the murder, slavery, exploitation of white racists of course). If you’re not a racist, nor subject to it on a daily basis – what do you have to fear or complain about really? Trust me, I’ve been on the receiving end of real racist attacks from black communities and been treated differently to degrees I don’t want to go into, but, that involved deep exploitation. Athough it pissed me off and effected my life for some years, I still hold no grudges and know that no progress can be made if I just play victim to that, and I’m white, so enjoy certain freedoms in the West that I do not take for granted. A taste of our own medicine can be good for our health and evolution and understanding. Maybe we should learn to listen to people, instead of undermining them by saying they sound like somebody else and instead of jumping down their throats as John did to that white guy… you know, be the better examples? Well Philip thanks for the vote of confidence so to speak although if I could just borrow a word or two from our former prime minister Paul Keating when he said ‘its a recession we had to have’. In a different vain this conversation with Matt Knight was something of a ‘re-session or procession we had to have’. It clears out the air, let each parties have their say whether right or wrong or something in between as Billy states we earthlings have forgotten how to have lively debates and disagreements needn’t end up acrimoniously as we can all learn to disagree to disagree or agree to disagree or disagree to agree or agree to agree. At the end of the day these discussions are a vital fertilizer to get things out in the open which may have been left festering in the back of people’s minds or even their subconsciousness. Maybe Matt Knight was having a bad week or there must have been something unresolved in his consciousness with my words about Mahesh being a trigger point for unleashing pent up energy accumulated from dealing with these unreasonable skepticons amidst the impending doom and gloom about to be unleashed upon the world. Whatever the reason is we all go through these moments which reminds us once again that we are all just human beings warts and all and that our psyche is definitely a fragile thing which must be handled with care and concern. As you aptly put it its the laws of cause and effect and whatever the word responsibility means I have decided that I have brought this situation or rather a test upon myself and that thanks to Matt Knight its definitely a conversation I had to have. Wherever the swinging waves our thoughts will end up and the nature of those swinging wave arriving at our doorstep from it somehow the old adage applies ‘we are a smith of our own destiny’ for the better or for the worse. I addressed specific things about your posts on this blog, i.e., calling everyone Astro-Tony to get a rise. My posts on the forum can take up to three days to appear; hardly the basis for a lively debate. Michael works hard to get posts up in a timely way to encourage lively debate. Moderators in the FIGU forum have historically supported Mahesh and cite the same weak arguments you do. What’s the problem… afraid you might not get so much support here? Maybe that’s because people here have met and care about Billy. I’m going to bed now, but, I’ll only address any comments you make here. If you patiently go through some of my posts over several years here there have only been a handful of people I called out. Now the intention behind it is, if you’ve somehow missed it, to encourage people to be upfront and honest and what better way to sift the wheat from the BS by testing people’s mettle to see what comes out of it. As you may well know Matt there have been numerous attempt by the so called enemies of truth to run amok here on false pretenses breaking the forum rules everyone responsibly abides by to make a mockery out of the Meier contact case and his information and truly you do have to keep the bastards honest from time to time. So you admit that you have called people out many times. Do you really think that the people you call out will go, “Okay, it’s a fair cop – you got me”. Better to address their logic than make accusations that promote a persecutory belief. My conclusions about Mahesh was borne out of observation as the situation laid itself out to be. It wasn’t the first time I have written here that Mahesh’s activities may have some positive aspect to it. I wrote about it here and no one seem to have any problems with it so Matt Knight why would you considering that you as a student of the spiritual teachings would’ve figured out by now that there is no such thing as 100% good or bad but only degrees within a spectrum. That also goes for human beings and his actions. To give you an example Korff’s nefarious activities contained some positives in that he was the simulating wing of the other half that inadvertently helped create controversy for the Billy Meier case just as perhaps Mahesh is inadvertently doing. The weak argument is that people in the future will see Mahesh’s work as a positive. Really – why are you attempting to immortalise that crap? You don’t think we have the intelligence to work out TODAY that what he says is flagrant perfectionist BS and that Mahesh’s weak arguments, i.e., that Billy is a liar, plaigariser, hoaxer, are not positive. Calling Billy a liar, hoaxer, plaigariser is 100% bad for Mahesh (see Kal Korff) and we should not entertain that. I wish Mahesh no harm (he was even a friend on FB before I closed my account recently) and I fear that may come to him if he continues on this track and being a student of the spiritual teaching I think we should not encourage that at all, especially those claiming to support the case. It seems to me that certain people do so for their own issues. If you’ve got issues with the material or with Billy, at least have the courage to cite them directly rather than hide behind someone else. Maybe that is the only good that can come out of this, i.e., it shows those who only support Billy on the surface, but, that have their own issues behind closed doors. The controversy was decided upon after the Plejaren got a better idea of what Earth humans were like. They would not have used controversy under normal circumstances, but, realised that Earthlings often only take an interest if there is controversy (see 9/11 conspiracies). Therefore, the controversy is only intended as one way into the material and should not be required for people who have studied the case for as long as Mahesh has, for example, or, for people that know the case is true and that are studying the spiritual teaching. Matt Knight you said ‘The weak argument is that people in the future will see Mahesh’s work as a positive. Really – why are you attempting to immortalise that crap’? ‘May be we cannot see it yet but within the detailed work by Mahesh there are some positives to be gained from it albeit at least for the future’. As flawed and ill intentioned Mahesh’s efforts maybe not to mention the flawed logic, conclusions and methodology I now see that there is some glimmer of positives coming out of his efforts. Well I am sure we’ve been through all this before and misunderstandings do occur especially as English language users. So you are putting words in my mouth Matt knight. Well just who exactly are you referring to? Sure we all have must vested interest in a brighter future knowing what we do through Billy and if people feel passionate about defending the truth then that is a good thing Matt. Matt once again a misunderstanding from your end. The ‘controversy’ aspect of the case wasn’t suddenly hatched up in the minds of the Plejaren midway through the contacts only after the Plejaren proved deeper into earthling’s psychology it was already part of it in the early years of the contacts as you can surmise from when Billy was first allowed to take pictures back in 1975-1976 or thereabouts. Now because of the ‘controversy’ to do with UFOs, which is also a component of the Meier case, we now have even blind Freddy’s from the mainstream occupying themselves with this subject. Now go back to when you didn’t know about the Billy Meier case did that ‘controversy’ become the springboard by which you began to notice about this topic well it certainly did for me as the close up photo of the underside of WCUFO hovering above a van offended me to the point where I deemed it a fraud at one point in time but only to get back in when other information from Gaiaguys and Dr Deadorff piqued my interest again but that photo definitely had an impact. Since the vast majority of earthlings haven’t recognised the genuineness of the case they too will need to go through their baby steps helped by the ‘controversial’ aspect of the case as a springboard and they are the ones I am referring to when I say that some positives may come about through Mahesh’s activities via that ‘controversy’ he may inadvertently create. There’s a few discrepancies in your responses that I’d like address, but, thanks for your responses so far. Matt – If the positives you were referring to are the small number of corrections Mahesh had made, what is it about those that you think we cannot see? We all acknowledge the corrections, but, they’re not important when considering all the evidence. What exactly are the “glimmer of positives coming out of his efforts” other than the above-mentioned corrections? There have been so many people that have contributed to corrections over the years, not least, of course, all the FIGU members, so, I’m confused as to why you (and others) would think Mahesh’s contribution is so significant and difficult for us to see now, whilst many criticise FIGU – even those supporting the case. I think many people supposedly supporting the case have got their priorities in a twist and we need to stand strong together to build this thing up. Underestimating the contributions of FIGU and exaggerating the contributions of Mahesh is no positive thing in my view, but, this is the view that seems prevalent on many public forums. Nothing that Mahesh has “revealed” has had any discernable effect on the case. I’d pretty much figured out that there was something wrong with the space pictures long ago and put that down to already explained interventions by the men in black according to previously released explanations from Ptaah about that and as I mentioned privately to Mahesh in discussion about this. The missing information Mahesh cites does not make the difference overall that he claims it does. He exaggerates the importance of these so let’s not support him in that delusion, or, exaggerate those corrections ourselves – unless there’s some unacknowledged investment in this. Finally, calling Meier is plaigariser, liar and hoaxer is 100% bad (not correct/illogical). There’s no “spectrum” in that for me. The controversy as cited by the Plejaren was in relation to very specific events, i.e., the pendulum UFO and there were not many of them. All other controversies are those created in the minds of the readers to explain mistakes, which no human being in physical form, anywhere in the unviverse, is immune to. Just ignore Mahesh. He is mentally ill. Such individuals, whether they are attacking Billy Meier’s evidence or attacking scientific evidence that does not suit their preconceived PC belief-system, are useless to humanity except perhaps as a bad example, and should not be flattered by pretending that debate with them is worth one’s time. Matt Knight to be clear about what those positives are rather than leave it to the imagination of others to figure out these positives from Mahesh’s activities I am talking about are…..
1) It draws attention to the case just as Kal Korff and many other critics have done thereby sustaining that ‘controversy’ Billy has spoken about. 2) Like I said as flawed and ill intended Mahesh’s efforts may be there has never been a critic of the case with as much access to as much of Billy related material as he has thus for what its worth his probe into certain aspect of the case will no doubt be more detailed and his scrutiny of them original. I hope you don’t read these words as a glowing endorsement nor agreement of Mahesh’s conclusions and put words in my mouth that somehow Iam in support of Mahesh’s ill advised and ill conceived actions. I am just matter of factly stating the outcome of my observation of the situation. 3) A study however in depth or cursory about Mahesh’s works will leave a person baffled at how, as detailed as his work is, logic is so absent from them which makes for a classic example of how absurd illogism and lack of wisdom avails faulty answers and wrong conclusion about Billy Meier’s contact case. Thus the weaknesses of human psychology and character is exposed then and there for those who can see this and it makes for a good case study for it. 4) Why are we even having this conversation in the first place other than as Billy’s supporters who have come to his defense and the defense of the truth with our own share of battles with the critics and skeptics alike over the years we do have very much invested in it for the obvious reasons but step back for a moment Matt Knight and just observe the reality for a second what do you see, what can you observe about the masses in relation to the Billy Meier contact case. Well I don’t know what you see but I see the vast majority of these ignorant ones, if presented with the Meier case, coming to the same conclusions as Mahesh with the same contention, stuck beliefs, preconceived biases, prejudicial viewpoints, laziness in thinking, painfully illogical, narrow mindedness, absent in wisdom, impulsive and unthinking spiritual wise. Now all these traits and characteristics or the expression of them are contained in Mahesh’s works and many other critics which will no doubt make for a good case study for our future generations to look back at our very critical era and thereby to learn from so that they don’t make the same mistakes as we do. 5) The more attention you give to Mahesh’s activities like you have and what we are doing now the more resolve he will have in defending his work and his actions like we defend the truth and Billy Meier. What has changed Matt Knight with all the hours spent on his blog as you have refuting his suspect lies and faulty conclusions other than provide for the record what the facts are as refutations for his criticism. He still does what he has continue to do as an adversary and there wasn’t a single thing you could do to stop him so why not heed Billy and Ptaah’s advice that its useless to waste time arguing with the critics but time is better spent for the mission if people work on translations and studying the spiritual teachings. I know what I am talking about I learnt the hard way. There is a lesson contained in everything not least this brief episode which transpired about Mahesh. I never thought Matt Lee was ‘defending’ Mahesh?,…. the hides behind other names here at MH’s blog? The only popular place it seems people have been allowed to hold him to some deeper account, beyond just against basic actions, thoughts, feelings, emotions. Seems like a lot of wasted thread here but everything does come down to cause and effect, over at the FIGU forum…. where I don’t usually participate? Thanks to MH to allow you two to thresh it out as even on FB groups there was censorship, deletion of naming certain names and their associated vile actions. Which seems most logical, neutral within striving for better things, in the entire picture. Studying the ‘spiritual teachings’ and honing the material consciousness within ones character, ability, values, virtues, assiduousness for love, peace, freedom, harmony, feelings for others, etc, etc, etc, etc, etc,etc. Well, the result of your comment is you fed into Mahesh’s delusion and that what he is doing is important and that WE validate that, which others, who claim to support the case, also do both publicly and privately. Let him get his ego stroked from the many skeptics that now follow him. What we should demand is that he back up his slander by doing a true, thorough, investigation at every opportunity and ban him until he comes back with some solid evidence (not evidence of mistakes) for his claims that Billy is a liar, plaigariser, etc. Instead people say, “Great work Mahesh” and “There’s actual value in this” and “I like skeptical arguments” blah de blah weak-assed bullcrap. Pathetic. This is still not in line with what Billy recommends in terms of how to deal with skeptics, which I know it appears I’m ignoring in all, this, but, want to balance things by asking what the hell people are thinking. Ignoring skeptics means ignoring skeptics – not providing them with a platform and saying, “Go ahead kid – you’re doing great work”. Other, unstated, motives are behind this and people should know from me that from now on – anyone supporting the case, but, that supports Mahesh’s work openly with weak-assed comments and ideas will have to deal with me as well because I’ll be coming for you and asking you to substantiate those until I get fed up of it (not likely). There is no difference between Kal Korff and Mahesh and people would not think to entertain Korff on the same terms and on FIGU forums but, do with Mahesh because he’s able to break down his lies and slander so as to fool people. My words about Mahesh aren’t a full fledged endorsement nor validation of his activities. I think you will have to read my post at FIGU again to understand the true intentions behind them. I am still a critic of Mahesh activities and critical of his intention. I think I was the initial person who implied that he was a rat catcher catching children and leading them to the forest and subsequent protest resulted from Mahesh to FIGU. You dance around like MJ. You’re not a critic on the forum, but are here. Consistency please. Did you suggest Mahesh was a rat catcher here on this blog and did Michael then take this up with FIGU? Stop dancing to stir up trouble. Matt Knight obviously you are not me and I am not you but most often when I do make a mistake and judged other people falsely and as soon as this is recognised by me I do try to walk the talk and apologise for my mistakes make amends and move on. Sure the egoism gets in the way at times but overall on the internet as well as in real life I do bite the ego so to speak and try to take the high road as best as I can. As life is though and I experience this almost everyday with people in my line of work it’s one of those pitifully painful sights when I see and observe people degrade themselves in hypocrisy by not being able to say sorry or make apologies for mistakes made because they are either too proud or their fragile egos will not allow them to be embarrassed so they go at all length to evade, side skirt, misdirect people’s attention, up the ante on their false accusations and project their own weakness onto the person who they are accusing something of. I think its about time you let go Matt and straighten out your priorities as there are bigger fishes to fry and more important things to be preoccupied with than arguing over misunderstandings. At the end of the day you will do what you do, I will do what I do in life, Mahesh will do what he does along with everyone here and around the world which makes up today, tomorrow, the week, the month, the year, the decade and the bicentenary and in amongst those moment by moments which makes up time there is right and there is wrong but I am glad that as a young man you Matt Knight is on the side of right and truth. Don’t give up the fight Matt but only when its the right fight worthy of fighting which is the good fight. Not in my book. This information is the most important information in human history and so we need to be mindful of how we promote and exaggerate the false claims of Mahesh on supposed FIGU-supporting forums and groups and yet allow so much criticism of FIGU to go unabated. Sheila has cited some examples of this and I have witnessed many examples of this myself. I’ve got my priorities straight, thanks and I’ll fight what I think needs fighting and pick my own fights and call time on those when I think I think it’s time in all good conscience. Just put it down to me doing what I will do as stated (which is a contradiction when you are trying to call time on that and control it). I find positives in those that critique or claim this case is a hoax. Especially from those that have convincing debunking attempts. There have been a few times when I’ve read some of Maheshs claims and thought initially he was on to something. Only later, after researching and reading comments debunking his debunking attempts, did it strengthen my understanding of the case. It really convinced me even more that this case is the truth. I must clarify for people here, the mistakes were nothing important or that pertained to any information that Billy has presented – so don’t anyone doubt that. There’s always both sides to every argument Matt. Perhaps there will be some good that comes out of Mahesh’s lying fingers. The fact remains that I’ve had multiple posts on the FIGU forum which have tried to warn others about Mahesh but we’re not posted. I would be far more concerned about the FIGU forum’s decision not to post anything negative about sweet little Mahesh than Matt lee’s post about maybe some good will come out of his treachery. Maybe Matt Lee was being sarcastic because other than last week, no one was allowed to say anything bad about Mahesh. Thanks for the understanding Sheila and being the few who actually gets it. I welcome Matt Knight’s challenge as we are all held to account by the same standards and whatever resolution or dissolution that comes out of these conversations can only help to resolve some nagging things that may have been left unchecked. I do feel it a little perplexing though that where it concerns Mahesh why posts get censored over at the FIGU forum. They may say that they censor the ones about him…but not about his actions. Yeah and I wonder what the reasons are although I might have some idea. I would like to believe that Michael but they refused to post my comment about Mahesh getting in contact wth Stan Friedman to give him stupid information before your second debate where you trounced him AGAIN. So there’s an action they didn’t want anyone to know about. Yeah, it’s too bad if that’s the case, Sheila. I’m sure Mahesh won’t touch that information because in his mind, he’s already refuted it. I never go to his BUMFOR site because I couldn’t care less about ANYTHING he has to say. Good luck to him in his sleazy endeavours. Matt Knight the unequivocal facts are that Mahesh has engaged in his debunking of Billy’s information long before I had any say in it and it didn’t take my validation nor invalidation for him to continue to do so nor for him to gain any naivetes who support him without their critical thinking. Once again I repeat my assessment from observation of the situation whether true or untrue is borne out of my own independent analysis of the situation as I perceives them to be which does not mean I encourage nor support his activities period. Now I know full well the nature of Mahesh’s malevolent actions without needing you to tell me what they are, its not like I am Johnny come lately to all this if you get what I mean. Now as the situation would have it, correct me if I am wrong I mean no offense, but as much as your response to the wrongs and injustices of the skeptics is laudable as defending the truth as Billy Meier supporters is one of our responsibilities that comes with it as we have all been there, I am sensing from your words a certain proccupation with wanting to be right over whether that right is right in the first place taking into consideration your overreaction to my words about Mahesh. Maybe deep down what you are after is some validation of your efforts and wanting some recognition for them rather than you doing it for the sake of truth alone. Sometimes our subconsciousness has a mind of its own and often its a mystery what it does to us or what its capable of doing as so much is buried inside. Have you considered that maybe your zeal to prove the skeptics wrong borders on the obsession so much so that instead of bringing counter balance to the skeptics contentions you are actually feeding their obsessions and resolve to prove the Meier case wrong. As well intended as you may be, behind the recent discussion we’ve had so far, there may just be a deeper underlying issues that are unresolved that you may have missed whether from your personal or professional life. As Billy advised we all need to do some self reflection. So whatever you say, your position in that comment is VERY clear and contradicts just about everything you’ve written above. I know where I stand and I’m not dancing to your mixed tune. Guess I know the differecne between genuine skepticism and someone that calls Billy a liar, plaigarist and hoaxer without any evidence. Make that an obsession if you want to. Matt Knight I have spelled the nature of what I think those positives are for you unless you aren’t bothering to read my post. You are reading way more into my words than is necessary which btw you have misunderstood and frankly its bordering on the childish now considering that I have explained myself adequately to you. If you turned the table around just for a moment and imagined it was me at the opposite end having the same contention with you over a few words of yours I am certain that you will find my false accusation of you uncalled for considering that I have no other evidence or instances of you engaged in supporting Mahesh nor can I provide additional proof that you did. Now why not give this same lesson to those who actually need it such as the skeptics who call Billy a liar and a hoaxer instead barking up the wrong tree. Besides with your recent witch hunting activities bordering on the same style as a thought police your actions of late are no different to those skeptics who engage in such filthy actions you rightly accuse them of doing. Then frankly are you truly any different then they? This as a fraternal brotherly advice to you GROW UP! Summary: Cue you responding that contradiction 1 is a good thing even though it isn’t and that we shouldn’t give Mahesh more attention because it fuels him, but, that’s a good thing. “May be we cannot see it yet but within the detailed work by Mahesh there are some positives to be gained from it albeit at least for the future”. Summary: So, Mahesh has had more access to the case than any other critic and his work is detailed, has positives and provides a springboard to people and offers glimmers of hope for the future, but, we SHOULDN’T read that as a glowing endorsement? Summary: Which is it: defend the case, or, not defend the case? Summary: So you think that people new to the case will have the depth of knowledge we have from studying the case for years to draw those conclusions from his work do you? Hey, at least WE can feel superior about their weakness if they don’t eh. Your position is about as clear as mud. Maybe you need to reflect on how Mahesh has fooled and confused YOU. I think we’ve given enough space for Mahesh to feel ego-satisfied, so let’s return to the actual topics. That can include specifically his failures in regard to the Iceman, his apparent lack of rebuttal to the new conclusion, etc., but I don’t see much being accomplished through more rehashing of his overall follies. I hank that’s the best idea. Take it over there to engage him. Thanks. The way I figure it, the more his work is scrutinized the more careful he will be with each of his silly posts. A few well-reasoned critiques every time he posts could very well wear him down. I’m willing to bet it’s the precise reason guys like Bartholomaus and Langdon refuse to allow comments on their pages. Very telling. Suppression is the ONLY defense against impeccable logic. Im sorry but that’s…off topic. Ha.